Every day, commuters in Rhode Island rely on public and private bus lines for transportation to work, school, shopping and traveling. The bus drivers, operators and management in RI are duty bound to provide hazard free public transportation to every community and safety to other sharing the roadway. Unfortunately, passengers, pedestrians, bicyclists and other drivers in Rhode Island often suffer serious life-threatening injuries in bus accidents all too often. 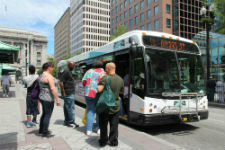 There are numerous major transportation providers across the nation, statewide in Rhode Island and in local communities. Many of these include municipally owned and operated commuter systems, and private businesses including Greyhound, Megabus, Amtrak Thruway Motorcoach, Coach USA and others. Under many state laws, common carrier bus lines are expected to provide a heightened responsibility of care. Unfortunately, the accidents they create are often caused by negligent actions of the bus driver, maintenance crews or management staff working for the bus line. If you were injured in a RI bus accident with a car, auto, truck or other motor vehicle then you should retain a rhode island bus accident lawyer. A bus accident attorney in Rhode Island will help you get the settlement that you deserve. Statistics maintained by the National Highway Traffic Safety Administration (NHTSA) indicate that approximately 300 individuals lose their lives every year in bus crashes. For the survivors, the level of their injuries and lifelong disabilities are usually catastrophic. This is because most buses in Rhode island and across the Nation are not equipped with seat belts and other safety features to protect passengers. In addition, the sheer size and weight of the bus traveling on roadways, side streets and highways can cause a devastating accident when colliding into other vehicles, bicyclists and pedestrians. Victims suffering serious injuries in Providence, and surviving family members of loved ones lost in a bus accident, might be entitled to receive financial compensation from the bus line company. The financial recovery they receive can pay for ongoing expenses including the cost of hospitalization, medical needs, surgeries, physical therapies and rehabilitation. In addition to their medical requirements, they might be entitled to receive compensation for time away from work and the inability to continue working in the future. Skilled RI personal injury attorneys who specialize in bus accident claims or truck / automobile accidents will also seek intangible costs on behalf of their clients including funds for the victim’s pain, suffering, grief, mental anguish and emotional distress. If you, or a loved one, have been injured in a bus accident in Rhode Island caused by the negligence of another, you can file for compensation. Through a claim or lawsuit, you can seek recompense for any kind of injury from relatively minor scrapes, bruises and bumps to severe life-threatening injuries including damaged internal organs, traumatic brain injury, spinal cord damage, broken bones and fractures. Surviving family members who of lost a loved one in a Pawtucket, Central falls or East Providence bus collision can file a wrongful death lawsuit against all parties at fault. To ensure you receive adequate compensation, it is essential to contact a East Providence personal injury attorney who specializes in bus vehicle accidents as quickly as possible. This is because the state’s statute of limitations requires all legal papers to be filed before a predetermined deadline expires. Reputable RI law firms accept bus vehicle (car) accident cases on contingency, which means you will owe them nothing until your claim or lawsuit is resolved.